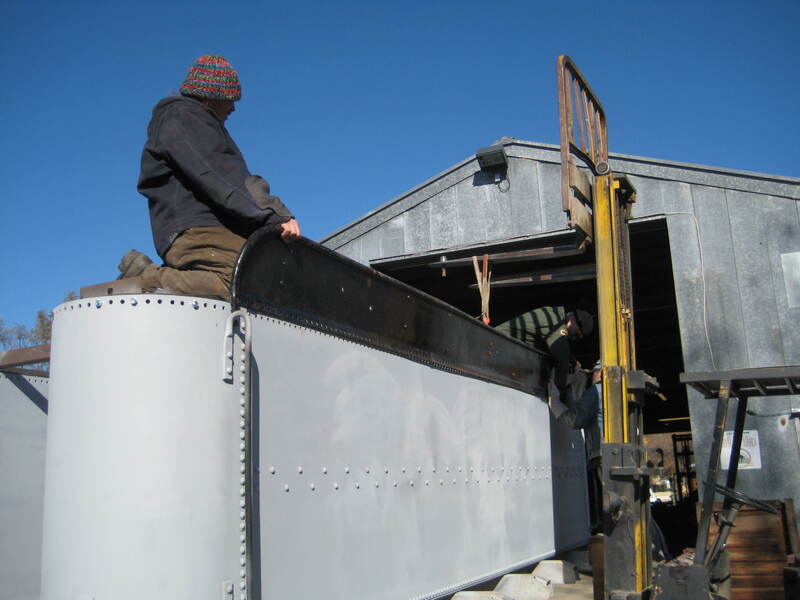 Rick Willson is building curved angle-iron for the tender. 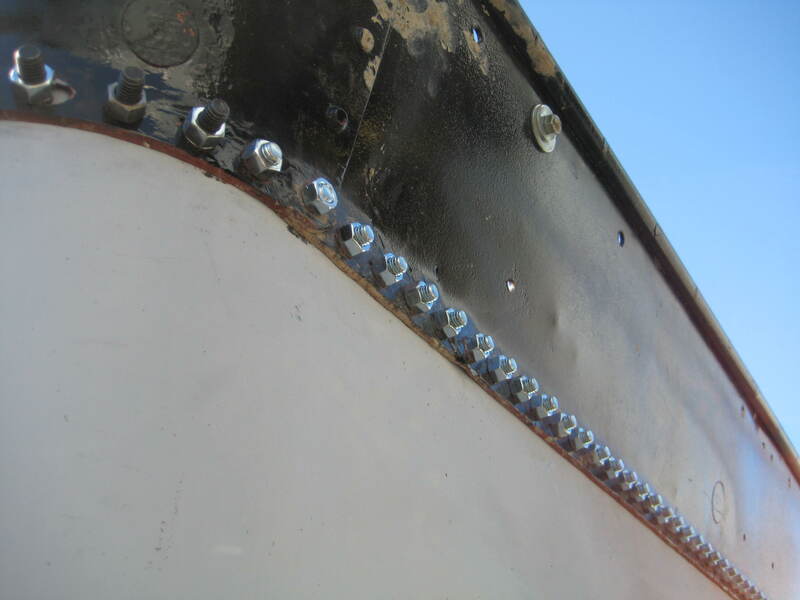 125 rivets completed in about 2 hours! To explain it in the most basic way- rivetting is the old way of connecting two pieces of metal together. Usually, holes are punched in both pieces of metal, and a red-hot steel pin with a head on top, is inserted in the holes. Then two workers, each armed with pneumatic rivetting guns, fitted with hardened steel cups at the ends, push against the two sides of the rivet. One worker is stabilizing the pre-formed head, while the other is forming the closing head on the other side. These days, a much better product is achieved by welding the metal together. The resulting seam takes less work, is stronger, requires fewer workers and corrodes more slowly. It also has a completely different finished look. 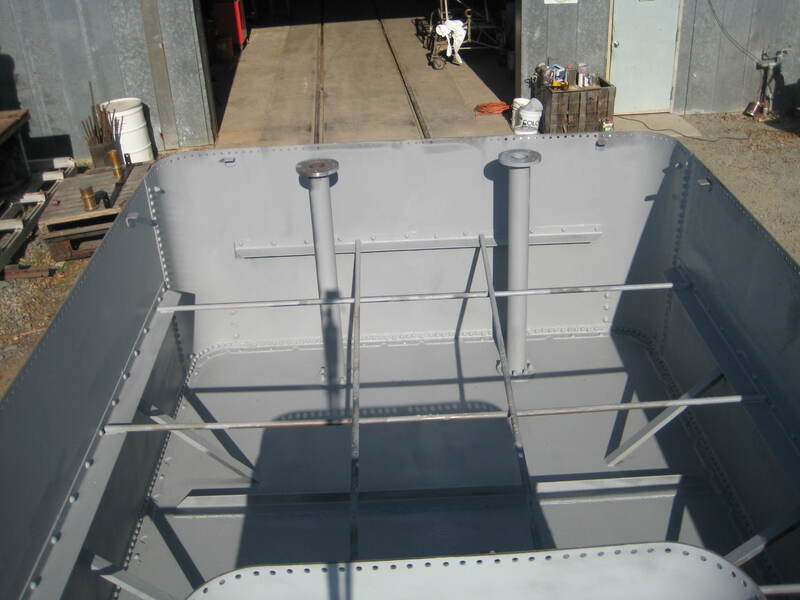 To achieve the best of both worlds, we are welding hidden seams on the new tender, and rivetting the exposed seams. Phil lines up the rivets in the forge to heat them. 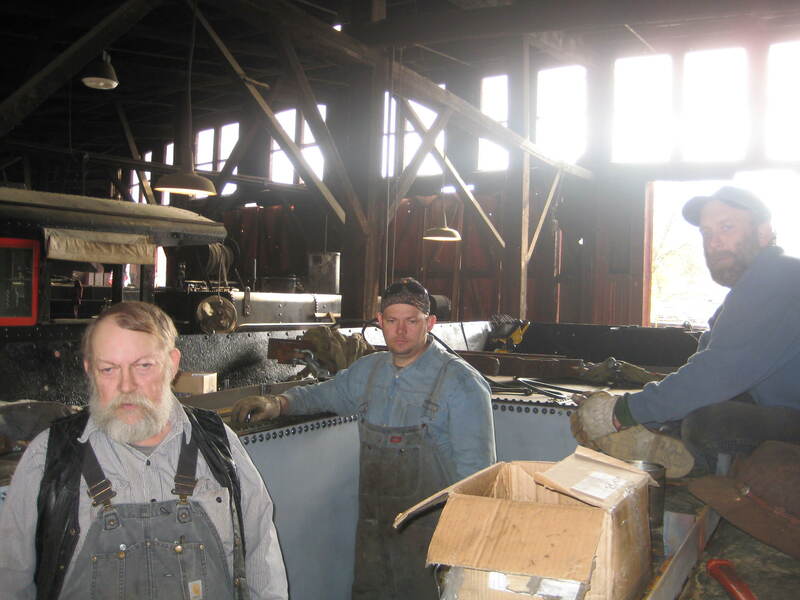 Shop workers waiting for the rivets to heat to start rivetting. Red-hot rivets visible through the porthole of the forge. Phil runs the red-hot rivet to the tender, and inserts it quickly into the hole. James and DJ stand by, waiting to start. James and DJ put some weight into it, and complete the rivet. This part is loud! The finished rivet! (The bolts on either side hold the unrivetted work in place). Just 3,182 more to go! Side of the tender cistern, example of a rivetted seam, and patch. Erik Young displays newly machined snap (l), and original snap from collection used as a model (r). Newly machined rivet snap showing cup at end used to mold the top of the hot rivet. Rivetting, as a method of connecting two pieces of metal, was once the method of choice in all forms of steel engineering. 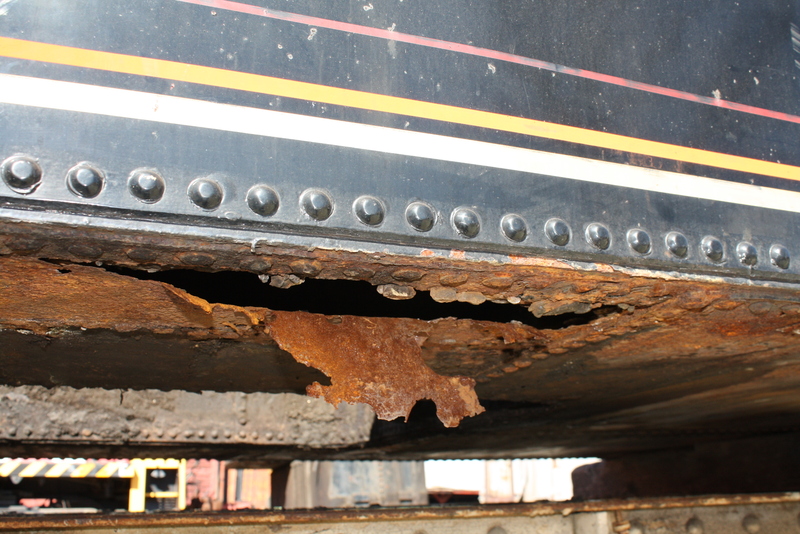 Older buildings, ships, boilers, trains, bridges, were all built by use of rivets. Rivetting is becoming a lost art. Since the 1920s, it has been replaced by welded seams in most cases. Welding creates a superior connection for several reasons. 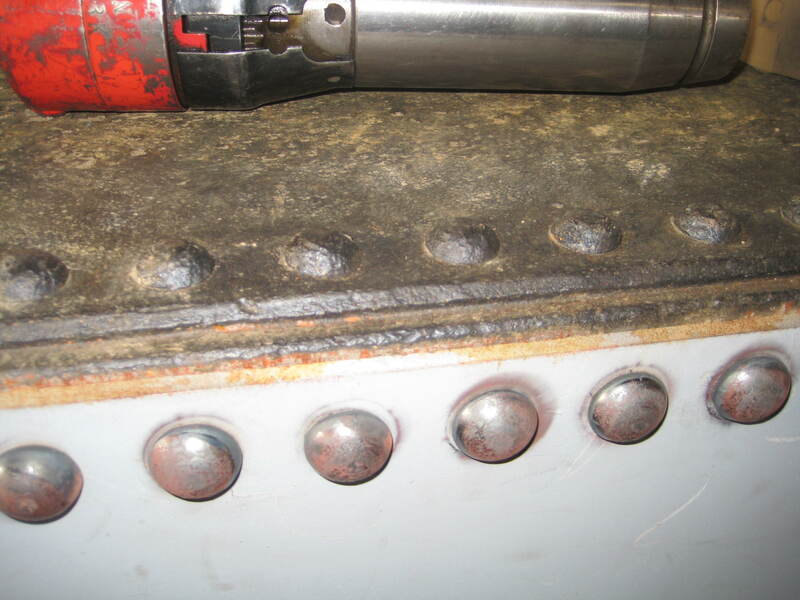 While rivets hold the seams together, welding actually connects the two pieces of metal, with a continuous seam, which results in superior strength, and less corrosion. 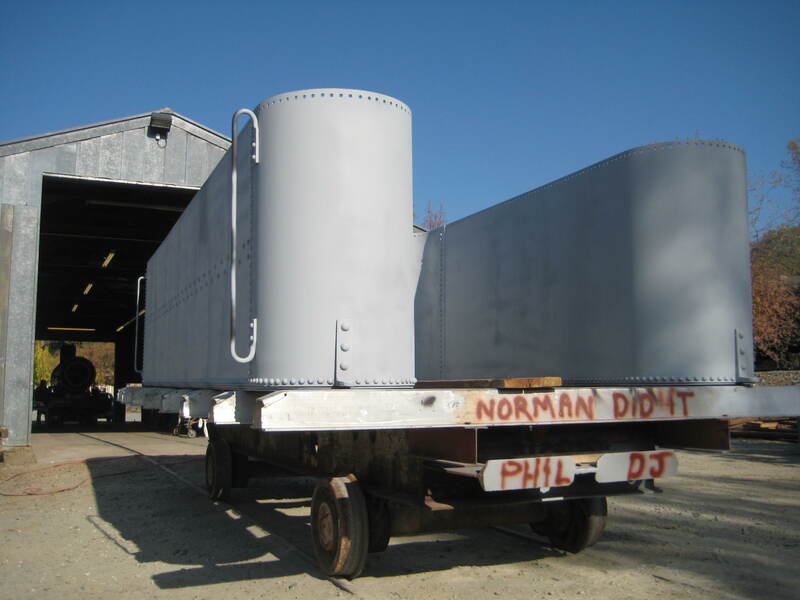 For the tender cistern on the Sierra #3, the decision was made to combine these two methods. The visible areas(on the tops and sides) will utilize rivetted seams. The hidden seams on the bottom will be welded. Our machinist, Bob West, has machined new rivet snaps (the cups used to form the closing rivet heads), using original artifacts as a model. We’ll be using these daily as we install over 3,100 rivets over the next month or so.